You can preview our currently available arrangements for Rock Me My Baby listed by instrument further down on this page. 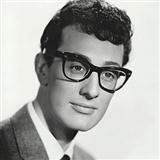 Buddy Holly is the author of Rock Me My Baby. A one page preview of Rock Me My Baby can be seen for each available score by clicking on this button next to the relevant score. In the section "select instrument" above all our scores for this piece, you can switch from viewing all available instruments for Rock Me My Baby to just one specific one. Is there a sheet music arrangement that you particularly liked? Then why not post your customer review by clicking on the Comments tab. Simply choose a handle (screen name), and you may post your thoughts on our music. Are you a net-savvy social networking guru? The why not use the share function on this page to post this song page to your Twitter account or Facebook page. You can also share via email and other social media. You currently have the choice of 1 arrangement for Rock Me My Baby. Within that number of scores there is currently a choice of 4 instruments.